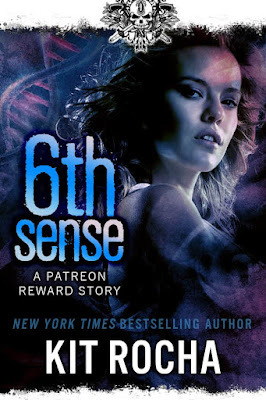 6th Sense is a short story that was originally available through Kit Rocha's Patreon page where you can sponsor the author and read a short story every month. After six months these stories become available on Kit Rocha's website so you can now read this one for free. These stories aren't meant to be standalone, they're written to give fans of the series a chance to catch up with favourite characters and just give us little glimpses into what's happening in this world now that the main series has finished. I've always loved Ashwin and Kora so I really enjoyed getting to see them talking about their hopes and fears for their upcoming new arrival. This was a really sweet little short, Ashwin is worried about how their genetic modifications might affect their baby in the future and he hates the fact that he can't plan for every possibility in advance. Kora is as sweet and loving as ever while she reassures him that there is nothing they can't handle together.